What is Fingerprint Scanning ? Fingerprint scanning is the acquisition and recognition of a person's fingerprint characteristics for identification purposes. This allows the recognition of a person through quantifiable physiological characteristics that verify the identity of an individual. There are basically two different types of finger-scanning technology that make this possible. One is an optical method, which starts with a visual image of a finger. The other uses a semiconductor-generated electric field to image a finger. There are a range of ways to identify fingerprints. They include traditional police methods of matching minutiae, straight pattern matching, moir? fringe patterns and ultrasonics. There are a greater variety of fingerprint devices available than any other biometric. Fingerprint recognition is the front-runner for mass-market biometric-ID systems. Fingerprint scanning has a high accuracy rate when users are sufficiently educated. Fingerprint authentication is a good choice for in-house systems where enough training can be provided to users and where the device is operated in a controlled environment. The small size of the fingerprint scanner, ease of integration - can be easily adapted to keyboards, and most significantly the relatively low costs make it an affordable, simple choice for workplace access security. Plans to integrate fingerprint scanning technology into laptops using biometric technology include a single chip using more than 16,000 location elements to map a fingerprint of the living cells that lay below the top layers of dead skin. Therefore, the reading is still detectable if the finger has calluses, is damaged, worn, soiled, moist, dry or otherwise hard-to-read finger surfaces--a common obstacle. This subsurface capability eliminates any attainment or detection failures. With any security system, users will wonder,. can fingerprint recognition system be beaten? In most cases, false negatives (a failure to recognize a legitimate user) are more likely than false positives. Overcoming a fingerprint system by presenting it with a "false or fake" fingerprint is likely to be a difficult deed. However, such scenarios will be tried, and the sensors on the market use a variety of means to circumvent them. For instance, someone may attempt to use latent print residue on the sensor just after a legitimate user accesses the system. At the other end of the scale, there is the gruesome possibility of presenting a finger to the system that is no longer connected to its owner. Therefore, sensors attempt to determine whether a finger is live, and not made of latex (or worse). Detectors for temperature, blood-oxygen level, pulse, blood flow, humidity, or skin conductivity would be integrated. Unfortunately, no technology is perfect--false positives and spoiled readings do occur from time to time. But for those craving to break free from the albatross that the password has become as both a security and time-management issue fingerprint scanners are worth looking into. It is estimated that 40 percent of helpdesk calls are password related. Whether incorporated into the keyboard or mouse, or used as a standalone device, scanners are more affordable than ever, allow encryption of files keyed to a fingerprint, and can, perhaps most importantly, help minimize stress over that stolen laptop. 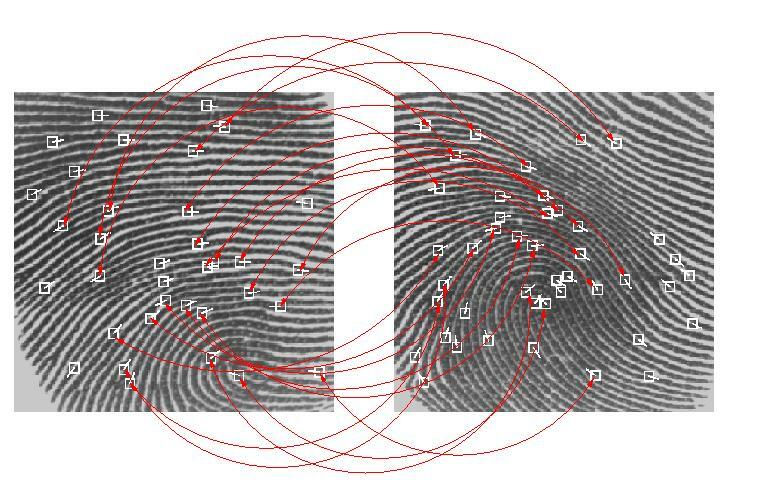 Fingerprint matching techniques can be placed into two categories: minutae-based and correlation based. Minutiae-based techniques first find minutiae points and then map their relative placement on the finger. However, there are some difficulties when using this approach. 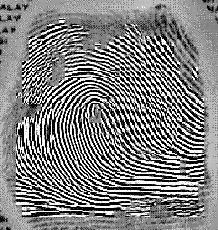 It is difficult to extract the minutiae points accurately when the fingerprint is of low quality. Also this method does not take into account the global pattern of ridges and furrows. The correlation-based method is able to overcome some of the difficulties of the minutiae-based approach. However, it has some of its own shortcomings. Correlation-based techniques require the precise location of a registration point and are affected by image translation and rotation. Fingerprint matching based on minutiae has problems in matching different sized (unregistered) minutiae patterns. Local ridge structures can not be completely characterized by minutiae. We are trying an alternate representation of fingerprints which will capture more local information and yield a fixed length code for the fingerprint. The matching will then hopefully become a relatively simple task of calculating the Euclidean distance will between the two codes. Fingerprint classification is a technique to assign a fingerprint into one of the several pre-specified types already established in the literature which can provide an indexing mechanism. Fingerprint classification can be viewed as a coarse level matching of the fingerprints. An input fingerprint is first matched at a coarse level to one of the pre-specified types and then, at a finer level, it is compared to the subset of the database containing that type of fingerprints only. We have developed an algorithm to classify fingerprints into five classes, namely, whorl, right loop, left loop, arch, and tented arch. The algorithm separates the number of ridges present in four directions (0 degree, 45 degree, 90 degree, and 135 degree) by filtering the central part of a fingerprint with a bank of Gabor filters. This information is quantized to generate a FingerCode which is used for classification. Our classification is based on a two-stage classifier which uses a K-nearest neighbor classifier in the first stage and a set of neural networks in the second stage. The classifier is tested on 4,000 images in the NIST-4 database. For the five-class problem, classification accuracy of 90% is achieved. For the four-class problem (arch and tented arch combined into one class), we are able to achieve a classification accuracy of 94.8%. By incorporating a reject option, the classification accuracy can be increased to 96% for the five-class classification and to 97.8% for the four-class classification when 30.8% of the images are rejected. A critical step in automatic fingerprint matching is to automatically and reliably extract minutiae from the input fingerprint images. However, the performance of a minutiae extraction algorithm relies heavily on the quality of the input fingerprint images. In order to ensure that the performance of an automatic fingerprint identification/verification system will be robust with respect to the quality of the fingerprint images, it is essential to incorporate a fingerprint enhancement algorithm in the minutiae extraction module. We have developed a fast fingerprint enhancement algorithm, which can adaptively improve the clarity of ridge and furrow structures of input fingerprint images based on the estimated local ridge orientation and frequency. We have evaluated the performance of the image enhancement algorithm using the goodness index of the extracted minutiae and the accuracy of an online fingerprint verification system. Experimental results show that incorporating the enhancement algorithms improves both the goodness index and the verification accuracy. Convenience First - There is the reason end-users should use fingerprint authentication in the IT world, i.e. security, and there is the reason they WILL use it, convenience. The simple fact is that passwords don't work very well. They are "nocost" to establish, but very expensive to maintain. Just ask the help desk manager in a major corporation. More than 50 percent of all help desk calls are related to passwords 3&Mac218;4 lost, forgotten or otherwise useless. Count all the passwords you use everyday and often have to change once a month. Password administration is a nightmare for MIS managers and users. Fingerprint authentication eliminates the problem, and the headaches. Other authentication mechanisms such as tokens, smart cards, etc. require you to carry something. This is better than a password, but easier to lose. Think about losing your credit card or driver's license. Losing your corporate network access card could be a lot worse. Information is valuable and harder to track than money. Fingerprints can also act as a simple, trusted and convenient user-interface to a well thought out security architecture. The two components need each other to provide truly effective security. A user authenticated via fingerprints can take advantage of a solid security system with minimal education. Simple Truths - Users don't trust what they don't understand. Most IT security concepts are incomprehensible to the common user. Explaining public and private keys, key recovery systems and digital certificates is beyond the skills of even experienced MIS professionals. Most users have no concept of encryption algorithms and their implementations, nor do they want to understand. Users want simple, trusted security. Simple, as in put your finger down. It does not take a security professional to realize that 10 passwords on sticky notes attached to your monitor are poor security. Most breaches of security require doing the obvious, and are often done by insiders. Trusted, as in having stood the test of time. Fingerprints have been used for identification for over 100 years. They are the standard without question. In addition to signatures, fingerprints are the only other form of identification that have a legal standing. A key issue of trust is privacy. 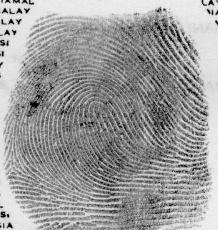 The best way to maintain that is to store a template of unique fingerprint characteristics instead of the entire print. This is sufficient for one-to-one or one-to-many matching and eliminates the need for a database of searchable fingerprints. Emerging Standards - IT professionals insist upon standards, multiple sources of supply and endorsement by industry leaders. It's beginning to happen, but to think that a small biometrics company can set an industry standard is ludicrous. Yet many have tried. Any CIO or MIS manager would not bet his job or company on a proprietary solution from a small biometrics company. These people want choice and standards to provide multiple sources of supply and fair competition among vendors. The one exception to this rule is when there has been a major catastrophe, such as a significant loss of money. However, it is tough to build a sustainable business chasing disasters. Standards need to be set by the IT industry leaders such as Intel, Microsoft, Phoenix Technologies and the top 10 computer companies. In the last year, many of these large organizations have banded together to begin the process of standardization. This is the first sign of an industry maturing. Cost - Just as in the early days of desktop computers when a system cost more than $10,000, only a few people had systems. Now when they cost less than $1,000, everybody has one. This same "order of magnitude" cost breakthrough has recently occurred with fingerprint technology. What cost $1,000 two years ago is now available for less than $100. Cost alone is not the answer, but it is a necessary component of broad market acceptance of this technology. Complete Solutions - Lots of companies talk about "complete solutions," but what does this mean? It does not mean a custom, proprietary combination of fingerprint sensor, matching software and application software - point products and closed solutions are not acceptable. It does mean an open architecture where the sensor, matching algorithm and applications are interchangeable and leverageable. Veridicom's OpenTouchTM architecture embraces this tenet and lets the user choose. Measurable Usefulness - Being able to accurately gauge the usefulness of a fingerprint authentication solution is very important. This technology saves money in password administration, user up-time and user support. More importantly fingerprint authentication allows you to do more with a computer. Now, remote secure network access is possible. Electronic commerce makes sense when the authentication is trusted. It is a fact that 75 percent of all Internet users are uncomfortable transmitting their credit card information over the public network. Imagine if this was never an issue. Fingerprint authentication is an enabling technology for trusted e-commerce. All the signs are in the market for the acceptance of fingerprint authentication as a simple, trusted, convenient method of personal authentication. Industry leaders are validating the technology through standards initiatives. Cost and performance breakthroughs have transformed fingerprint biometrics from an interesting technology to an easy to implement authentication solution. Industry trends such as electronic commerce and remote computing exacerbate the need for better authentication. Most importantly, users understand and accept the concept. Passwords and tokens are universally disliked. You can't get much simpler than a fingerprint. The aura of criminality that accompanies the term "fingerprint" has not significantly impeded the acceptance of fingerprint technology, because the two authentication methods are very different. Fingerprinting, as the name suggests, is the acquisition and storage of the image of the fingerprint. Fingerprinting was for decades the common ink-and-roll procedure, used when booking suspects or conducting criminal investigations. More advanced optical or non-contact fingerprinting systems (known as live-scan), which normally utilize prints from several fingers, are currently the standard for forensic usage. They require 250kb per finger for a high-quality image. Fingerprint technology also acquires the fingerprint, but doesn't store the full image. It stores particular data about the fingerprint in a much smaller template, requiring from 250-1000 bytes. After the data is extracted, the fingerprint is not stored. Significantly, the full fingerprint cannot be reconstructed from the fingerprint template. Fingerprints are used in forensic applications: large-scale, one-to-many searches on databases of up to millions of fingerprints. These searches can be done within only a few hours, a tribute to the computational power of AFIS. AFIS (Automated Fingerprint Identification Systems) - commonly referred to as "AFIS Systems" (a redundancy) - is a term applied to large-scale, one-to-many searches. Although fingerprint technology can be used in AFIS on 100,000 person databases, it is much more frequently used for one-to-one verification within 1-3 seconds. Many people think of forensic fingerprinting as an ink and paper process. While this may still be done in some locations, most jurisdictions utilize optical scanners known as livescan systems. There are some fundamental differences between these forensic fingerprinting systems (used in AFIS systems) and the biometric fingerprint systems used to logon to a PC. When the differences between the two technologies are explained, nearly all users are comfortable with fingerprint technology. The key is the template - what is stored is not a full fingerprint, but a small amount of data derived from the fingerprint's unique patterns. Response time - AFIS systems may take hours to match a candidate, while fingerprint systems respond with seconds or fractions of seconds. Accuracy - an AFIS system might return the top 5 candidates in a biometric comparison with the intent of locating or questioning the top suspects. Fingerprint systems are designed to return a single yes/no answer based on a single comparison. Scale - AFIS systems are designed to be scalable to thousands and millions of users, conducting constant 1:N searches. Fingerprint systems are almost invariably 1:1, and do not require significant processing power. Capture - AFIS systems are designed to use the entire fingerprint, rolled from nail to nail, and often capture all ten fingerprints. Fingerprint systems use only the center of the fingerprint, capturing only a small fraction of the overall fingerprint data. Storage - AFIS systems generally store fingerprint images for expert comparison once a possible match has been located. Fingerprint systems, by and large, do not store images, as they are not used for comparison. Infrastructure - AFIS systems normally require a backend infrastructure for storage, matching, and duplicate resolution. These systems can cost hundreds of thousands of dollars. Fingerprint systems rely on a PC or a peripheral device for processing and storage. Already the leading non-AFIS technology in the biometric market, fingerprint is poised to remain the leading non-AFIS technology through 2007. Because of the range of environments in which fingerprint can be deployed, its years of development, and the strong companies involved in the technology's manufacture and development, fingerprint revenues are projected to grow from $144.2m in 2002 to $1,229.8m in 2007. Fingerprint revenues are expected to comprise approximately 30% of the entire biometric market. A number of basic factors should combine to help drive fingerprint revenues. If and when biometrics become a commonly used solution for e-commerce and remote transactions, segments expected to grow rapidly through 2007, fingerprint will be a primary benefactor. fingerprint is a very strong desktop solution, and it is anticipated that the desktop will become a driver for biometric revenue derived from product sales and transactional authentication. Most middleware solutions leverage a variety of fingerprint solutions for desktop authentication. Fingerprint is a proven technology capable of high levels of accuracy. The fingerprint has long been recognized as a highly distinctive identifier, and classification, analysis, and study of fingerprints has existed for decades. The combination of an innately distinctive feature with a long history of use as identification sets fingerprint apart in the biometric industry. There are physiological characteristics more distinctive than the fingerprint (the iris and retina, for example), but technology capable of leveraging these characteristics has only been developed over the past few years, not decades. Strong fingerprint solutions are capable of processing thousands of users without allowing a false match, and can verify nearly 100% of users with one or two placements of a finger. Because of this, many fingerprint technologies can be deployed in applications where either security or convenience is the primary driver. Reduced size and power requirements, along with fingerprint's resistance to environmental changes such as background lighting and temperature, allow the technology to be deployed in a range of logical and physical access environments. Fingerprint acquisition devices have grown quite small - sensors slightly thicker than a coin, and smaller than 1.5cm x 1.5cm, are capable of acquiring and processing images. Though radical changes in the composition of the marketplace would need to occur to undermine fingerprint's anticipated growth, the technology does face potential growth inhibitors. As opposed to technologies such as facial recognition and voice recognition, which can leverage existing acquisition devices, fingerprint's growth is contingent on the widespread incorporation of sensors in keyboards, peripherals, access control devices, and handheld devices. The ability to acquire fingerprints must be present wherever and whenever users want to authenticate. Currently, acquisition devices are present in but a tiny fraction of authentication environments. A percentage of users, varying by the specific technology and user population, are unable to enroll in many fingerprint systems. Furthermore, certain ethnic and demographic groups have lower quality fingerprints and are more difficult to enroll. Testing has shown that elderly populations, manual laborers, and some Asian populations are more likely to be unable to enroll in some fingerprint systems. In an enterprise deployment for physical or logical security, this means that some number of users need to be processed by another method, be it another biometric, a password, or a token. In a customer-facing application, this may mean that a customer willing to enroll in a biometric system is simply unable to. In a large-scale 1:N application, the result may be that a user is able to enroll multiple times, as data from his or her fingerprints cannot be reliably acquired. If the system is designed to be more forgiving, and to enroll marginal fingerprints, then the common result is increased error rates. Fingerprint technology is used by hundreds of thousands of people daily to access networks and PCs, enter restricted areas, and to authorize transactions. The technology is used broadly in a range of vertical markets and within a range of horizontal applications, primarily PC/Network Access, Physical Security/Time and Attendance, and Civil ID. Most deployments are 1:1, though there are a number of "one-to-few" deployments in which individuals are matched against modest databases, typically of 10-100 users. Large-scale 1:N applications, in which a user is identified from a large fingerprint database, are classified as AFIS. 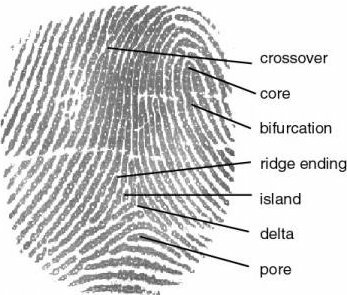 The human fingerprint is comprised of various types of ridge patterns, traditionally classified according to the decades-old Henry system: left loop, right loop, arch, whorl, and tented arch. Loops make up nearly 2/3 of all fingerprints, whorls are nearly 1/3, and perhaps 5-10% are arches. These classifications are relevant in many large-scale forensic applications, but are rarely used in biometric authentication. This fingerprint is a right loop. Minutiae, the discontinuities that interrupt the otherwise smooth flow of ridges, are the basis for most fingerprint authentication. Codified in the late 1800's as Galton features, minutiae are at their most rudimentary ridge endings, the points at which a ridge stops, and bifurcations, the point at which one ridge divides into two. Many types of minutiae exist, including dots (very small ridges), islands (ridges slightly longer than dots, occupying a middle space between two temporarily divergent ridges), ponds or lakes (empty spaces between two temporarily divergent ridges), spurs (a notch protruding from a ridge), bridges (small ridges joining two longer adjacent ridges), and crossovers (two ridges which cross each other). Other features are essential to fingerprint authentication. The core is the inner point, normally in the middle of the print, around which swirls, loops, or arches center. It is frequently characterized by a ridge ending and several acutely curved ridges. Deltas are the points, normally at the lower left and right hand of the fingerprint, around which a triangular series of ridges center. The ridges are also marked by pores, which appear at steady intervals. Some initial attempts have been made to use the location and distribution of the pores as a means of authentication, but the resolution required to capture pores consistently is very high. Once a high-quality image is captured, there are a several steps required to convert its distinctive features into a compact template. This process, known as feature extraction, is at the core of fingerprint technology. Each of the 50 primary fingerprint vendors has a proprietary feature extraction mechanism; the vendors guard these unique algorithms very closely. What follows is a series of steps used, in some fashion, by many vendors - the basic principles apply even to those vendors who use alternative mechanisms. The image must then be converted to a usable format. If the image is grayscale, areas lighter than a particular threshold are discarded, and those darker are made black. The ridges are then thinned from 5-8 pixels in width down to one pixel, for precise location of endings and bifurcations. Minutiae localization begins with this processed image. At this point, even a very precise image will have distortions and false minutiae that need to be filtered out. For example, an algorithm may search the image and eliminate one of two adjacent minutiae, as minutiae are very rarely adjacent. Anomalies caused by scars, sweat, or dirt appear as false minutiae, and algorithms locate any points or patterns that don't make sense, such as a spur on an island (probably false) or a ridge crossing perpendicular to 2-3 others (probably a scar or dirt). A large percentage of would-be minutiae are discarded in this process. The point at which a ridge ends, and the point where a bifurcation begins, are the most rudimentary minutiae, and are used in most applications. There is variance in how exactly to situate a minutia point: whether to place it directly on the end of the ridge, one pixel away from the ending, or one pixel within the ridge ending (the same applies to bifurcation). Once the point has been situated, its location is commonly indicated by the distance from the core, with the core serving as the 0,0 on an X,Y-axis. Some vendors use the far left and bottom boundaries of the image as the axes, correcting for misplacement by locating and adjusting from the core. In addition to the placement of the minutia, the angle of the minutia is normally used. When a ridge ends, its direction at the point of termination establishes the angle (more complicated rules can apply to curved endings). This angle is taken from a horizontal line extending rightward from the core, and can be up to 359. In addition to using the location and angle of minutiae, some vendors classify minutia by type and quality. The advantage of this is that searches can be quicker, as a particularly notable minutia may be distinctive enough to lead to a match. A vendor can also rank high versus low quality minutia and discard the latter. Those vendors who shy away from this methodology do so because of the wide variation from print to print, even on successive submissions. Measuring quality may only introduce an unnecessary level of complication. Approximately 80% of biometric vendors utilize minutiae in some fashion. Those who do not utilize minutia use pattern matching, which extrapolates data from a particular series of ridges. This series of ridges used in enrollment is the basis of comparison, and verification requires that a segment of the same area be found and compared. The use of multiple ridges reduces dependence on minutiae points, which tend to be affected by wear and tear. The templates created in pattern matching are generally, but not always, 2-3 times larger than in minutia - usually 900-1200 bytes. Form factor is a term used to describe the manner in which a biometric sensor is imbedded into an acquisition device, Biometric sensor, in particular fingerprint sensors, can be imbedded on top of a device, on its side, recessed or protruding. Some biometric devices require users to sweep their fingers across the them while others require that users place their fingers on the sensors and hold them still until they are authenticated. Though the placement of the biometric sensor is important from an ergonomic standpoint, several other considerations are equally important form factors. One of them is the type of device that the user interacts with. Several broad categories of device types are listed below. Desktop peripherals include biometrically-enabled mice and other handheld devices that computer users interact with when they operate a desktop computer. Because the standard size of desktop peripheral is typically small, the biometric sensor must also be small enough to fit on the device. However, the sensor's ability to acquire images effectively also diminishes as it is made small enough to fit on the peripheral devices. Embedded desktop solutions include biometrically-enabled keyboards and other primary components of computers that computer users interact with when they operate a desktop computer. Because the embedded desktop devices are larger than desktop peripherals, sensor size is not as significant a consideration -- the sensors can be large enough to acquire images without compromising the ability of the device to operate effectively. Since desktop devices like keyboards are typically cheap, the addition of an embedded sensor should not significantly increase its cost. 3. Embedded physical access solutions. Embedded physical access solutions include biometrically-enabled keypads and other devices that users interact with to gain access to restricted areas (i.e., opening doors). Because physical access solutions are often used to protect items of value and because making the device small typically isn't a concern, the sensors can be large enough to meet this security requirement. Several other factors, including the location of the device (indoors or outdoors), the type of client (military, government or commercial) and purpose of the device (apartment access, protect nuclear materials) will also be important in determining how the embedded physical access solution is deployed. 4. Embedded wireless handheld solutions. Embedded wireless handheld solutions include biometrically-enabled cell phones and other mobile personal communication devices that require owner authentication to use. Like desktop peripherals, embedded wireless handheld solutions, wireless devices are small and, consequently, the biometric sensor must also be small enough to fit on the device. Similarly, the sensor's ability to acquire images effectively diminishes as it is made small enough to fit on the wireless device. Ultimately the type of application being deployed and the environment in which it is being rolled out will drive the form factor. In fact, these form factors will have implications on what type of sensor technology is used in the fingerprint device. Today there are three primary sensor technologies: optical, ultrasound and silicon. Each sensor technology has its advantages and disadvantages. For example, optical sensors are durable and temperature-resistant, qualities that lend themselves well to usage in embedded military equipment solutions. However, because optical sensors must be large enough to achieve quality images, they are not well suited to embedded desktop solutions and embedded wireless handheld solutions. On the other hand, silicon sensors are able to produce quality images with less surface area, they are better suited to use in these compact devices. Acquiring high-quality images of distinctive fingerprint ridges and minutiae is a complicated task. The fingerprint is a small area from which to take measurements, and the wear of daily life affects which ridge patterns show most prominently. Increasingly sophisticated mechanisms have been developed to capture the fingerprint image with sufficient detail and resolution. The technologies in use today are optical, silicon, and ultrasound. Optical technology is the oldest and most widely used. The finger is placed on a coated platen, usually built of hard plastic but proprietary to each company. In most devices, a charged coupled device (CCD) converts the image of the fingerprint, with dark ridges and light valleys, into a digital signal. The brightness is either adjusted automatically (preferable) or manually (difficult), leading to a usable image. Optical devices have several strengths: they are the most proven over time; they can withstand, to some degree, temperature fluctuations; they are fairly inexpensive; and they can provide resolutions up to 500 dpi. Drawbacks to the technology include size - the platen must be of sufficient size to achieve a quality image - and latent prints. Latent prints are leftover prints from previous users. This can cause image degradation, as severe latent prints can cause two sets of prints to be superimposed. Also, the coating and CCD arrays can wear with age, reducing accuracy. Optical is the most implemented technology by a significant margin. Identicator and its parent company Identix, two of the most prominent fingerprint companies, utilize optical technology, much of which is developed jointly with Motorola. The majority of companies use optical technology, but and increasing number of vendors utilize silicon technology. Silicon technology has gained considerable acceptance since its introduction in the late 90's. Most silicon, or chip, technology is based on DC capacitance. The silicon sensor acts as one plate of a capacitor, and the finger is the other. The capacitance between platen and the finger is converted into an 8-bit grayscale digital image. With the exception of AuthenTec, whose technology employs AC capacitance and reads to the live layer of skin, all silicon fingerprint vendors use a variation of this type of capacitance. Silicon generally produces better image quality, with less surface area, than optical. Since the chip is comprised of discreet rows and columns - between 200-300 lines in each direction on a 1cmx1.5cm wafer - it can return exceptionally detailed data. The reduced size of the chip means that costs should drop significantly, now that much of the R&D necessary to develop the technology is bearing fruit. Silicon chips are small enough to be integrated into many devices which cannot accommodate optical technology. Silicon's durability, especially in sub-optimal conditions, has yet to be proven. Although manufacturers use coating devices to treat the silicon, and claim that the surface is 100x more durable than optical, this has to be proven. Also, with the reduction in sensor size, it is even more important to ensure that enrolment and verification are done carefully - a poor enrollment may not capture the center of the fingerprint, and subsequent verifications are subject to the same type of placement. Many major companies have recently moved into the silicon field. Infineon (the semiconductor division of Siemens) and Sony have developed chips to compete with Veridicom (a spin-off of Lucent), the leader in silicon technology. Ultrasound technology, though considered perhaps the most accurate of the fingerprint technologies, is not yet widely used. It transmits acoustic waves and measures the distance based on the impedance of the finger, the platen, and air. Ultrasound is capable of penetrating dirt and residue on the platen and the finger, countering a main drawback to optical technology. Until ultrasound technology gains more widespread usage, it will be difficult to assess its long-term performance. However, preliminary usage of products from Ultra-Scan Corporation (USC) indicates that this is a technology with significant promise. It combines a strength of optical technology, large platen size and ease of use, with a strength of silicon technology, the ability to overcome sub-optimal reading conditions. Fingerprint classification is a technique to assign a fingerprint into one of the several pre-specified types already established in the literature which can provide an indexing mechanism. Fingerprint classification can be viewed as a coarse level matching of the fingerprints. An input fingerprint is first matched at a coarse level to one of the pre-specified types and then, at a finer level, it is compared to the subset of the database containing that type of fingerprints only. We have developed an algorithm to classify fingerprints into five classes, namely, whorl, right loop, left loop, arch, and tented arch. The algorithm separates the number of ridges present in four directions (0 degree, 45 degree, 90 degree, and 135 degree) by filtering the central part of a fingerprint with a bank of Gabor filters. This information is quantized to generate a FingerCode which is used for classification. Our classification is based on a two-stage classifier which uses a K-nearest neighbor classifier in the first stage and a set of neural networks in the second stage. The classifier is tested on 4,000 images in the NIST-4 database. For the five-class problem, classification accuracy of 90% is achieved. For the four-class problem (arch and tented arch combined into one class), we are able to achieve a classification accuracy of 94.8%. By incorporating a reject option, the classification accuracy can be increased to 96% for the five-class classification and to 97.8% for the four-class classification when 30.8% of the images are rejected.